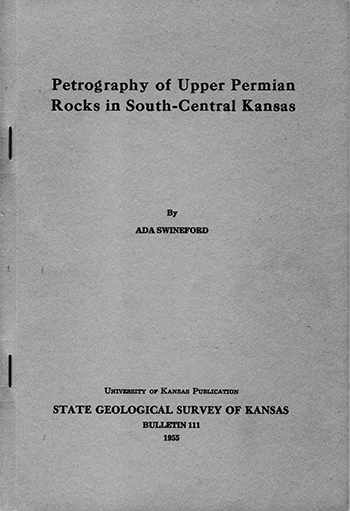 Originally published in 1955 as Kansas Geological Survey Bulletin 111. This is, in general, the original text as published in 1955. The information has not been updated. Blanket-type deposits of post-Wolfcampian Permian age exposed in south-central Kansas constitute a northern part of the mid-continent Permian basin. They are restudied petrologically with reference to their composition, texture, structure, stratigraphy, and genesis. The sediments are predominantly red in color, and consist of very fine-grained nonfossiliferous feldspathic sandstones and siltstones, silty shales and shales, and extensive thin evaporites. The detrital minerals of the sandstones and siltstones are primarily of igneous origin and are poorly rounded. The feldspars consist predominantly of orthoclase, with minor sodic plagioclase and microcline; they display various stages of weathering. The most common clay minerals are illite and chlorite, with montmorillonite in the upper part of the section. The rocks are assigned to Krynine's tectonic arkose series but are far from their source areas and are intra-cratonal rather than postgeosynclinal in origin. These important differences are reflected chiefly in the clay mineralogy, average particle size, and shape and extent of the deposits. The red color is due essentially to hematite stain on the mineral grains. The redbeds are classed with the primary detrital redbeds of Krynine, and the iron oxide is thought to have been transported as coatings on the detrital minerals and in colloidal solution from distant highlands, chiefly in Colorado and Oklahoma, having granitic terrane and humid tropical climate. The site of deposition is considered to have been a shallow restricted marine basin with deficient rainfall. Present commercial use of the deposits is restricted essentially to the evaporites in the section: salt and gypsum. Some of the rocks formerly were used for building stone, common brick, and paint pigment. Some of the shale is potentially useful for ceramic aggregate and brown slip glaze. Placed on web Aug. 25, 2006; originally published May. 1955.